After a nice breakfast with Diana and Joey, I returned to trail at 8:40am after a very restful zero day yesterday. The intention of the zero was also to dodge the tornado warning that came through and predicted storms. I heard from hikers that there was some hard rain two nights ago and high winds last night, but fortunately the days were clear. When I got on today, there was still a good chance for rain thorough the day, but nothing dangerous. Then the next five days show perfect hiking weather with cooler temps and sunny skies! It’s always difficult to hike out after a zero. I had a full pack with five days of food and a good climb to do of 2,500ft in 4.5mi. 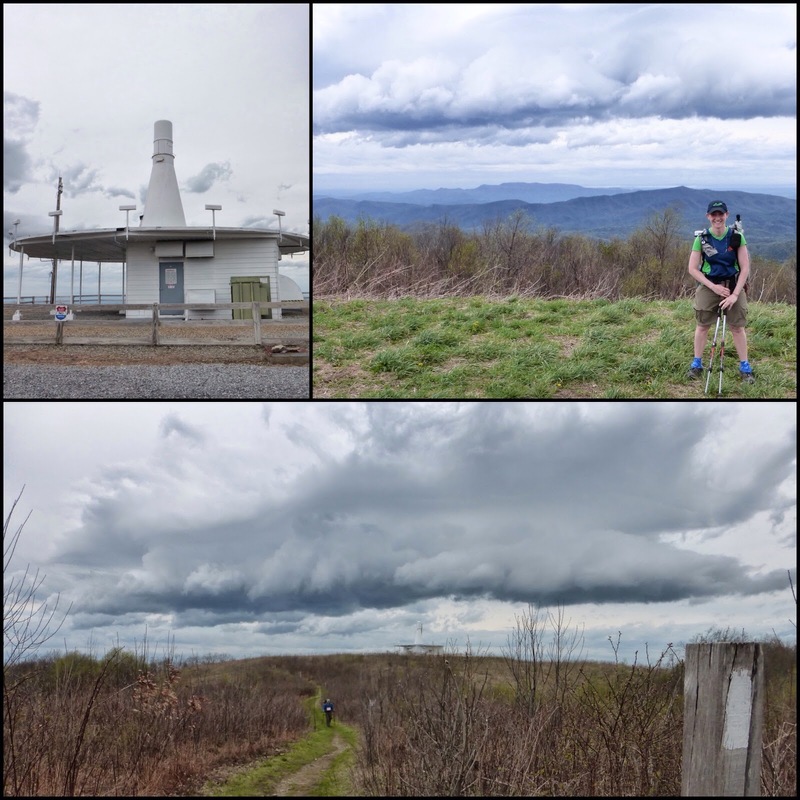 Fortunately, it was overcast and that made for much easier hiking! I saw four other hikers as I went up and was able to get my picture on top of the first mountain called Snowbird Mtn which also had an FAA tower that looked like it was from the Jetsons with strict no trespassing warnings. 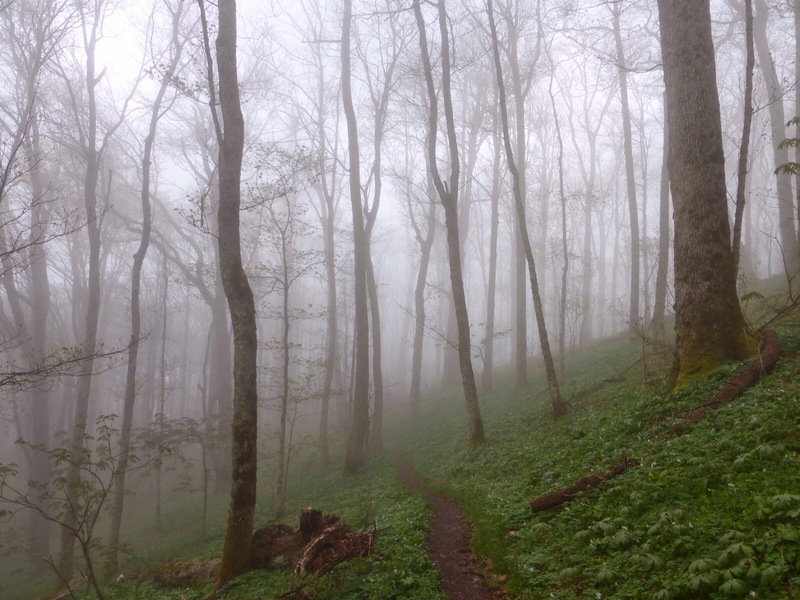 The next big event of the day is one of the most liked summits along the whole trail. 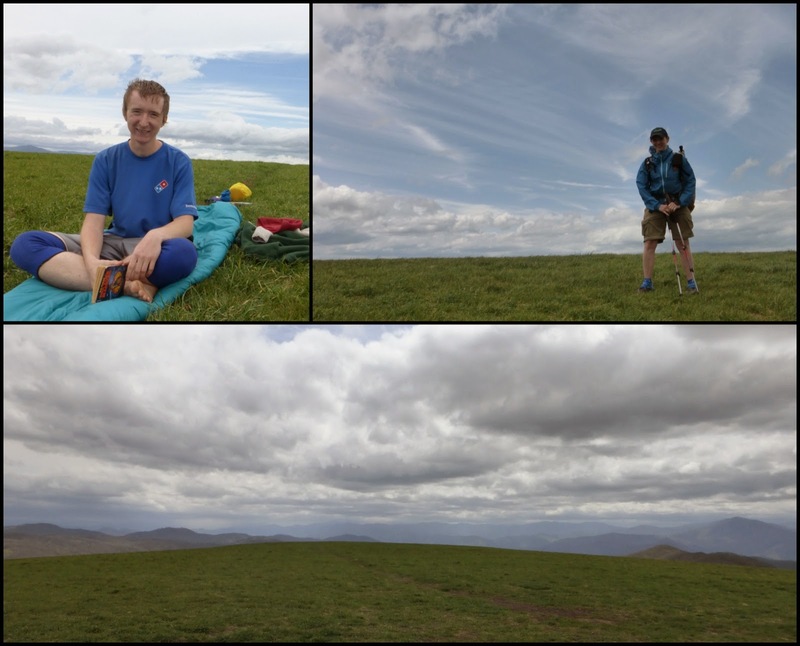 It is called Max Patch and out here the open grassy areas on top of summits are known as balds (no trees I guess). It is about 1/4mi of an open summit with panoramic views that made me think of the PCT and CDT. I had lunch up there with an 18yr old hiker named Domino(worked and wears a Dominoes Pizza shirt) who was blown away by the view. He pulled out his sleeping bag and said he planned to spend a couple hours up there as he had said he found heaven. Seriously, he was running around barefoot and everything. It was amusing and he was a character doing this hike on a tight budget with his diet mainly being honey and peanut butter straight out of the jar. He was nice enough to take some pictures for me too. He also mentioned that it looked just like the scene Windows uses for its default desktop background. I agree! The rest of the day was really quiet and I saw one other hiker briefly and some southbound section hikers. I again enjoyed listening to Divergent and am hooked. I’m almost done with the first book and might start Allegiant tomorrow. 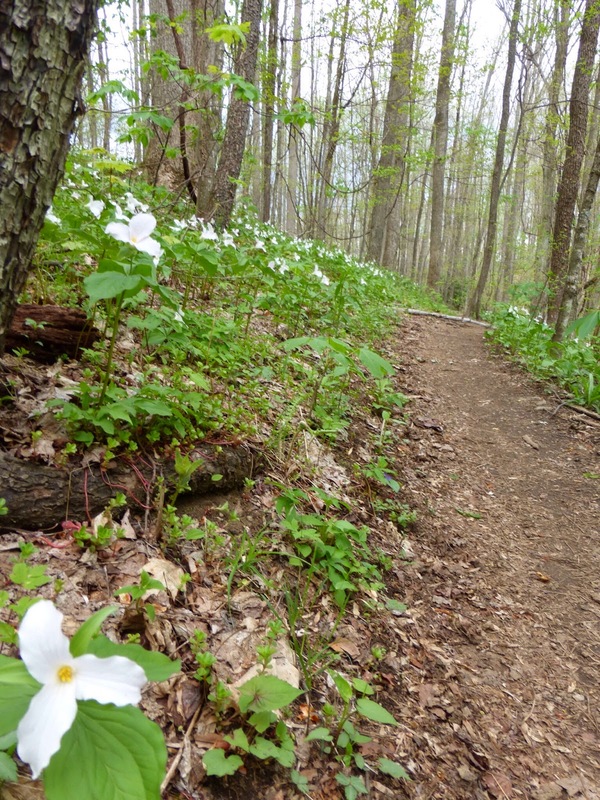 The trees are definitely filling in when the trail dips to the lower elevations. 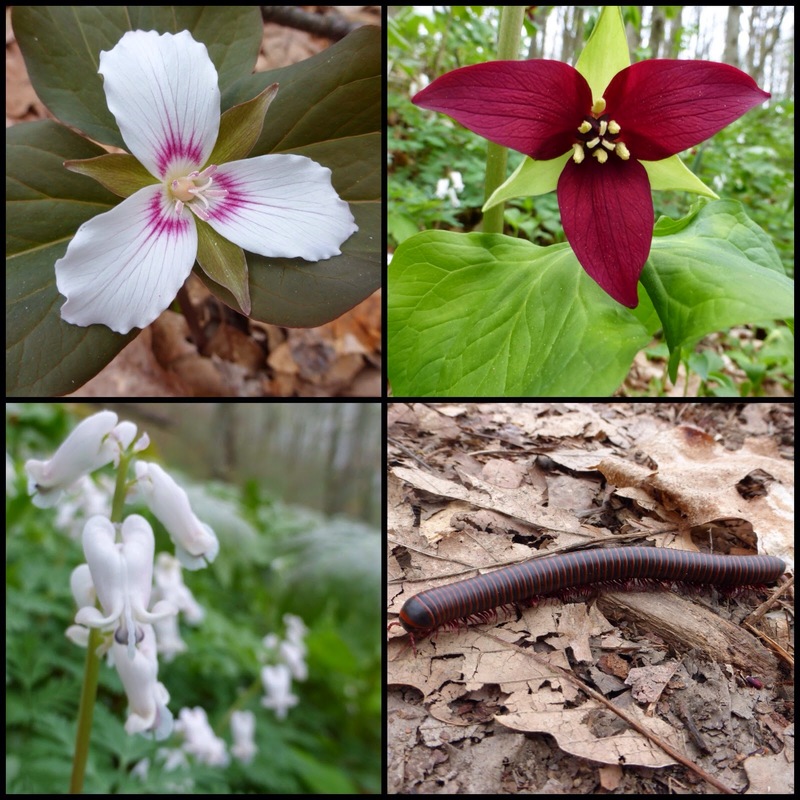 Today there were a few cool new flowers I haven’t seen on trail yet if anyone would like to identify them along with a millipede looking thing that is everywhere and makes me shiver. 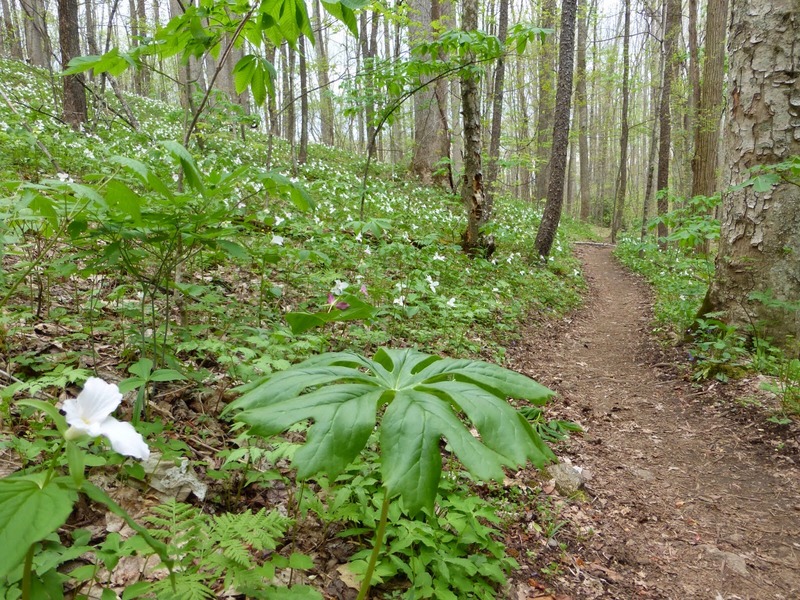 There were also a TON of trilliums and a short palm tree looking plant I’ve seen all trail called may apples, is starting to get the little apples below them. Around 5pm, it started to drip slightly on and off. Then the last hour of the day changed randomly from nothing, to a drizzle, to a steady rain. Each lasting short spurts. It was nice enough to use my umbrella with my rain jacket and shorts. I passed a shelter with 6 other hikers, but it was still early so I hiked on. 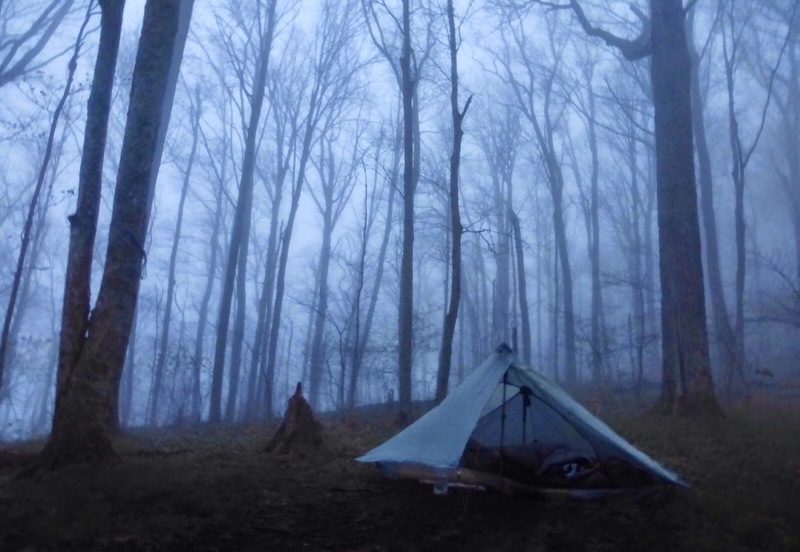 When I reached my intended camp spot, it was on top of a mountain and in a cloud of fog. I thought weather might be nicer down lower, so I hiked a bit further as the trail went down to a lower campsite another mile away. I thought I was a genius as the fog seemed to be moving out. Then I turned a corner and it was back as quickly as it came. I got to camp at 6:30pm and the fog has played this game of coming and going and it has rained on and off the last two hours. The weather says it will clear overnight. And the rain seems to have died off, but the fog is quite thick. I’m looking forward to the nice weather that starts tomorrow! That last pic looks so spooky! Like from a horror movie. I couldn’t sleep there alone! I’m such a wimp.